Mega Moolah : the progressive jackpot starts at £1.000.000 !!! Mega Moolah, the first online progressive jackpot slot in the world ! Microgaming’s Mega Moolah slot is without a shadow of a doubt one of the most popular slots on the market, especially for high rollers ! Get ready to set out on an adventure full of excitement in the heart of the African savannah where you will meet friendly-looking wild animals with this progressive jackpot slot! Mega Moolah sports a Safari theme which seems to be inspired by “The Lion King” film. Launched in 2006, this online slot has lost nothing of its popularity and appeal in the gaming community. Not only is it packed with stunning graphics and fun animations which bring the game to life, but it is also one of the first progressive jackpot slots ever produced. This illustrates the high-creativity levels alongside the innovation demonstrated by the team behind the leading slot provider which never ceases to amaze us. The reels sit on a background depicting the warm glow of the sun setting over the jungle, the sky taking on hues of burning ochres. When it comes to the RTP percentage, it stands at 88.12%. Dive into the colourful world of this video slot game for an unforgettable gaming experience which could make you a millionaire if you are lucky enough to hit the Mega progressive jackpot it features. As a matter of fact, this slot machine holds the Guinness world record for the largest online slot payout. 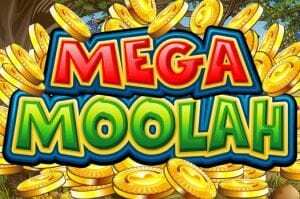 Mega Moolah by Microgaming initially earned the title in 2015 after a UK player from Cardiff hit the jackpot for £13,209,300, however it broke its own record on the 28th September 2018 when it paid out an impressive £16,807,724 !!! 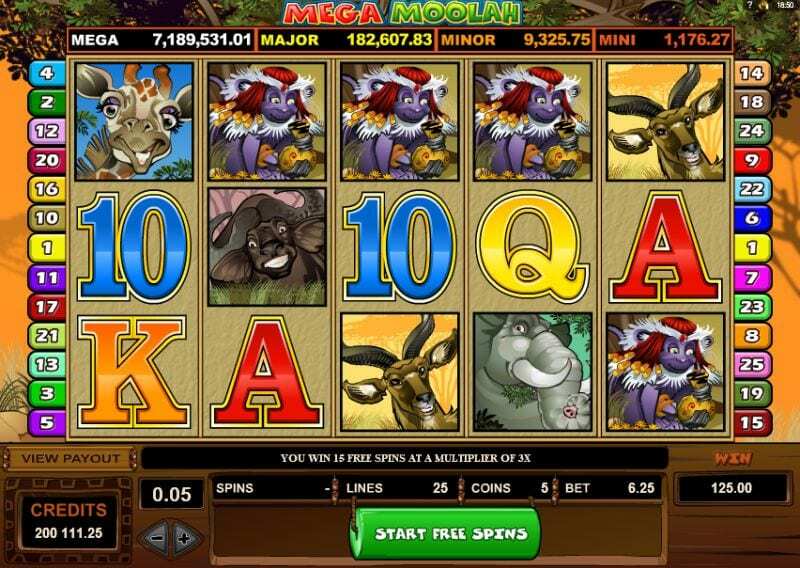 Mega Moolah is 5-reel, 3-row slot game with 25 paylines. The betlines it features are adjustable, meaning this enables the player to select the ones they wish to bet on. It is playable from a minimum bet starting at just £0.01, which goes up to £6.25. The jackpot feature in this online slot is triggered at random, however the higher your wager, the more chances you have of hitting the jackpot. High-rollers, rejoice! On the reels of this video slot, you will encounter a variety of intricately designed and vibrant symbols depicting wild animals typically found grazing or hunting in the dry African tallgrass savannah, which represent the highest paying symbols. The lower value symbols dispersed among the reels on the other hand are represented by the classic playing card symbols such as the A, K, Q, J and 10. In order to land a winning combination, one must line up at least 3 matching symbols on an active payline. Every time you land a winning combination, the symbols will come to life for an even more entertaining gaming experience. The cartoon-like animals are those with the highest value. They include an antelope, a zebra, a giraffe, a water buffalo and an elephant. The latter will grant players 750 coins for every 5 symbols they line up on an active betline. The highest potential combination however may be obtained by landing a winning combo featuring 5 of the lion symbol, for such a combination will pay 15 000 coins! In addition to this, the king of the jungle also acts as a wild symbol in Mega Moolah slot and will substitute for any other symbol found on the reels aside from the scatter symbol to help you complete winning combinations and win even more coins, for it will also double the payout from the win. When it comes to the scatter symbol, it represents a purple-faced monkey. It does not offer massive winnings, however it has quite a few tricks up its sleeve for gamblers. It is beyond doubt that what makes this online slot machine so appealing to a vast number of players is the 4 progressive jackpots it features. Progressive Jackpot slots are unquestionably the most thrilling of all, for gamblers from all around the globe contribute to the prize pool every time they spin the reels. The Mega Moolah jackpots are linked together across all Microgaming-powered casinos. An array of online casino operators include this slot game in their portfolio and due to its ever-increasing popularity, this allows all 4 jackpots in offers to reach outstanding sums since it reaches a large number of gamblers who continuously make it grow as they keep placing bets on it. The total sum of the jackpots is usually displayed above the reels and this promises to keep your adrenaline pumping as you will see the prize which could be yours increasing at a rapid pace right before your eyes! As one could expect, there are more sectors on the wheel for the smallest jackpots, and only one for the Mega progressive jackpot. Once it comes to a rest, the segment at which the arrow is pointing at will determine the jackpot to be won by the gambler. Moreover, when a player hits one of the jackpots, it will automatically be reset to its initial predetermined value. As regards the Mega Moolah Mega Jackpot for example, the minimum threshold is of £1 million ! Keep in mind that entering the bonus game is a guarantee that you will walk away with one of the jackpots! 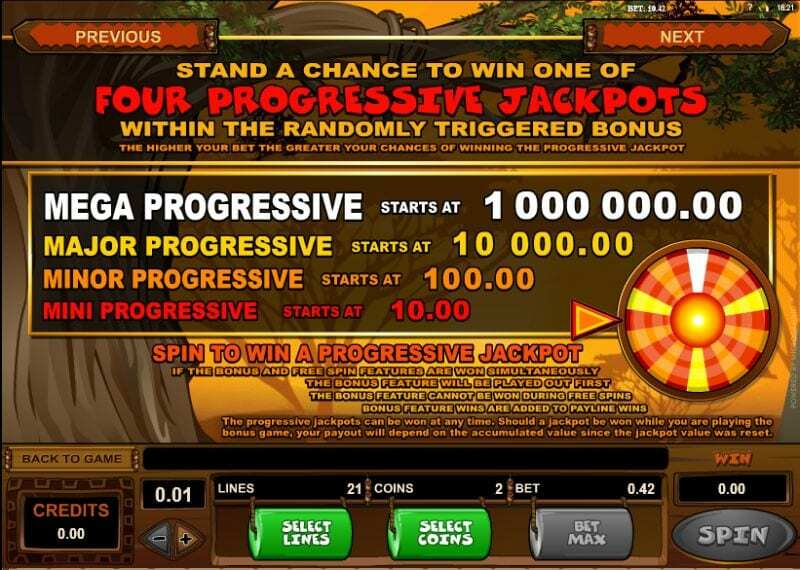 As if that wasn’t enough, Mega Moolah progressive Jackpot slot also has a Free Spins feature. In order to activate it, one must land 3, 4 or 5 scatter symbols representing a monkey. You will then receive 15 Free Spins during which all winnings will be subject to a x3 multiplier. Please note that during the Free Spins, the Mystery Jackpot game may not be unlocked. Released in November 2006, Mega Moolah Jackpot slot will take you on an exotic journey through the African savannah alongside a herd of wild. The splendid visuals paired with the immersive soundtrack made up of sounds straight from the depths of the jungle it features make for a truly enjoyable gameplay. It also has a Return to Player (RTP) of 88.12% and a hit frequency of 46.36%, however that is not what most gamblers are after when they play this online video slot. What makes the player experience it provides so exciting is without doubt the 4 progressive jackpots on offer – including one multi-million jackpot – which have already made numerous millionaires. It is compatible with all types of devices, meaning whether it be on smartphone, tablet, or desktop, you may spin its reels on the medium you prefer. According to the slot provider’s statistics, their progressive jackpot network has already rewarded players with over £779 million till this day. This low-volatility slot is ideal for players with any type of budget, however it is mainly aimed at high-rollers. If you have always dreamed of going for a safari in the wilderness and have a taste for adrenaline-pumping adventures, Mega Moolah delivers all that you may want from a progressive jackpot online slot!